If you’re not familiar with the Elastic Stack it is a suite of products for ingesting data or logs, searching, analysing and visualising. There is a good overview over at the Elastic web site of how it can be put together. I say “can” because the stack is very flexible and, for example, you can send JSON documents to Elasticsearch via a REST API, rather than use Filebeat or Logstash. 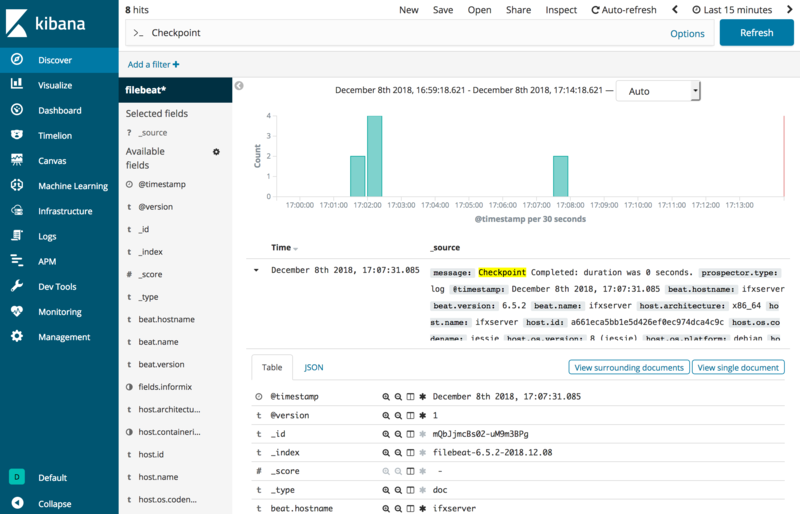 This blog post is mostly concerned with ingesting the Informix online log with Filebeat, recognising certain types of log line that can occur and tagging the file using rules set up in Logstash, before sending it to Elasticsearch for storage and indexing. Finally Kibana can be used to visualise the data stored in Elasticsearch. It’s easy to see how this could be scaled up to provide a single place to visualise logs from multiple instances and it would be fairly trivial to add in other logs too, like the Informix bar logs and logs from the operating system. At IIUG 2018 in Arlington, VA I presented a talk entitled DevOps for DBAs, which demonstrated the Docker set up now described below but I hadn’t at the time documented the full set up at the time. Here it is! Informix 12.10.FC12W1DE, listening on port 9088/tcp for onsoctcp connections. Logstash 6.5.2, listening on port 5044/tcp. Elasticsearch 6.5.2, listening on port 9200/tcp. Kibana 6.5.2, listening on port 5601/tcp. For a secure production implementation it’s recommended that you use Nginx with HTTPS as a reverse proxy for the Kibana web service as shown in the diagram. We’ll be using Nginx in this demonstration, rather than connecting to Kibana directly, but we won’t be configuring SSL; there are plenty of online guides about how to do this. Also communication between Filebeat and Logstash should be encrypted: this blog post doesn’t cover this. The above versions are current at the time of writing (December 2018). Elasticstack moves very quickly so it is likely these will not be the latest versions by the time you read this. The idea of this blog post is that you should just be able to copy and paste the commands and end up with a working system but you shouldn’t be surprised if things don’t work perfectly if your versions don’t match the above. For example, in between beginning this blog post and finishing it, version 6.5.x was released with improved default security settings, with services only listening on the loopback interface without reconfiguration. Running the whole Elasticstack in Docker plus Informix does require a reasonable amount of memory and I’d suggest a minimum of 2.5 GB to be allocated to the Docker Engine. Your terminal should now be inside the Docker container and logged in as root. Run these commands to install some the software-properties-common package and then install OpenJDK 8, which is required by Elasticsearch and Logstash. Java 9 should be fine too. The Debian Docker image does not come with many packages pre-installed so I am also going to install vim for editing files later plus a few other essentials; you may prefer nano or another editor. The Debian Docker container is a basic installation so this short list of packages have hundreds of dependencies. The Elasticsearch installation is more straightforward than Oracle Java and follows standard Linux methods for setting up and installing from a third party software repository. We need the HTTPS transport package installing before we can proceed to install. Elasticsearch will work right out of the box which is fine for the purposes of this demonstration and (after we start the service) will be listening on localhost only on ports 9200 for the REST API and 9300 for node communication. Again Kibana doesn’t require any reconfiguration for the purposes of this demonstration and will listen on localhost only on port 5601. This commands also ensure the service starts on boot. As Kibana is only listening on localhost and therefore unreachable from an external web browser, we will set up Nginx as a reverse proxy. This is a more secure configuration and recommended for any production implementation because only Nginx is directly exposed to the internet and not Kibana. Comment out the line beginning with try_files. A custom config file, /etc/logstash/conf.d/informix.conf, for parsing the Informix online log. The Informix config file requires that Filebeat tags the file with “[field][informix] = true“; this condition is trivial to remove if you wish. You could also use systemd to do this. Now both Docker containers are running you should be able to test name resolution and connectivity both ways with ping. These names belong to the containers and are not necessarily their host names. This means (nearly) all online log messages will be prefixed with the date (MM/DD/YY format) and time (HH:MM:SS format). Filebeat’s configuration file is /etc/filebeat/filebeat.yml. If you’re not familiar with yml files correct indentation with two spaces per level is absolutely essential; yml files rely on this for structure instead of any braces or brackets. Lines beginning with a dash indicate an array. onstat -c | grep MSGPATH reveals that the Informix online log file resides at /opt/ibm/data/logs/online.log and we want Filebeat to ingest this and pass it to Logstash running in the other container for parsing. The Informix online log quite often contains wrapped lines and these generally don’t start with a timestamp or date of any kind. Finally set up the output by commenting out (add a ‘#’) to all parts of output.elasticsearch and uncommenting section output.logstash. Set hosts in this section to [“elasticstack_monitoring:5044”]. You should see the message: Config OK.
You should now be able to log into Kibana on http://localhost/ and add an index on filebeat*. Then in the Discover section you should be able to see Informix log lines coming into the system and how they have been tagged. This particular blog post is going to end shortly. Kibana is a big subject and at this stage of my Elasticstack DevOps journey, I don’t feel qualified to write a blog on the subject. Once I’ve progressed further I may do a follow-on post. The tagging of events in the online log like the checkpoint duration and its assignment to variable informix.ckpt_duration should allow you do easily do searches based on this and visualise them in dashboards.